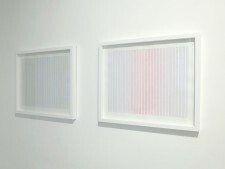 Laure Genillard are pleased to present a series of light-based works by British artist Adam Barker-Mill. Adam Barker-Mill is concerned with the physical and experimental properties of light. From early 60’s, his studies in painting led to experiments with colour film animation and subsequently to a career in the film industry, making films on artists for the Arts Council and working as a Lighting Cameraman on feature-length films. In the darkened upper ground floor, Barker-Mill presents an immersive time-based wall mounted light box with a hole in its centre, entitled CHROMAT 8, 2014. 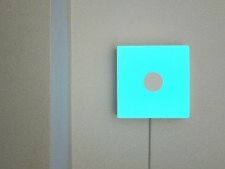 Its double aperture offers a spectrum of colours, one colour gradually blending into another, in a timed canon-form sequence engineered using LED technology. 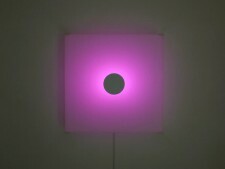 Downstairs, CIRCLE IN A SQUARE, 2013 give the viewer a similar multi-colour optical experience, in a fully-lit environment; both use as light-source a simple colour-changing bulb. 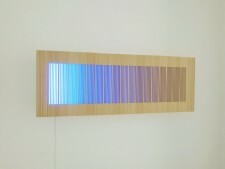 WIDESCREEN 2, 2013 gives the chance to view a wall-mounted sculpture construction made in hardwood, illuminated by a single colour (blue) which appears to fluctuate in its intensity depending on the viewer’s own position. 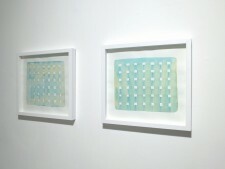 Adam Barker-Mill's works are deceptively simple and constructed with commonly found materials. The effect is subtle and surprising; distinctions of spatial perception or of colour may appear blurred. Is the circle flat or is it three-dimensional? Is the colour we see the actual colour or merely a retinal after-image? Awareness of such perceptual distortions, and of the conditions that bring them about, develops over the time of the viewing experience. A rigorous minimalistic approach succeeds in giving us an ethereal experience full of sumptuous colors where less is more. Adam Barker-Mill | Just Noticeable Differences - Part 1 'Chromat 8' from Laure Gennilard on Vimeo.